1 What Is A Prolapsed Disc? If you suffer from back pain, you may be suffering from one of the more common causes of back pain: a prolapsed disc. Also known as a herniated, slipped, or ruptured disc, damage in your vertebrae can lead to pain across your back. Here’s what you should know about the causes of and treatments for this condition. The spine is a complex structure consisting of 33 vertebrae, including 24 articulating vertebrae and nine fused vertebrae in the sacrum and coccyx. 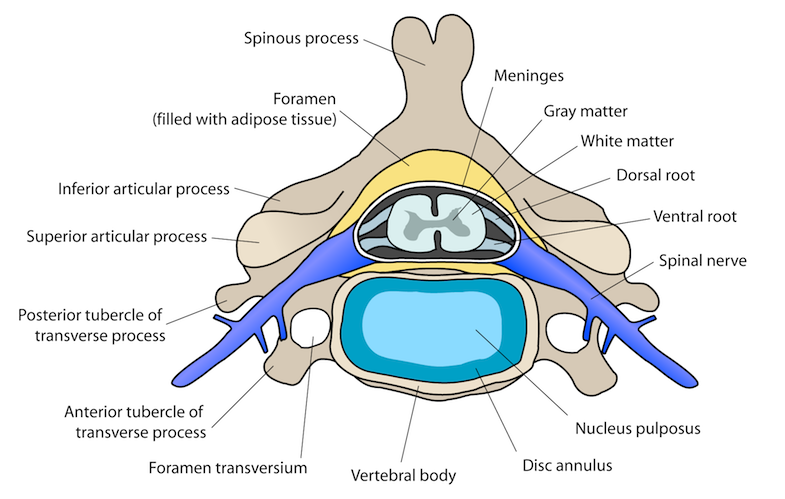 Each vertebra is separated by an intervertebral disc. These intervertebral discs are soft and spongy and act as shock absorbers for your spine. They also contribute to the overall flexibility of the spine. The intervertebral discs are made up of an inner layer and an outer layer. The inner layer (nucleus pulposus) is soft and gel-like and the outer layer (annulus fibrosis) is tough and fibrous. The outer layer is responsible for holding in the inner layer. A prolapsed disc, which may also be called a herniated, slipped, or ruptured disc, occurs when the nucleus pulposus herniates through the outer layer of the disc. The prolapsed disc then puts pressure on other structures in the spinal column, most notably, the spinal nerves. The pain that occurs with prolapsed discs is believed to be the result of nerve compression by the bulging disc. Inflammation around the affected nerve may also contribute to a patients’ pain. The intervertebral discs of the lumbar spine are the most commonly herniated discs, although any disc of the spine may be affected. The extent of a disc herniation varies widely; in general, patients with larger bulges are expected to experience more severe pain. Symptoms of a prolapsed disc can vary from patient to patient with some patients reporting sharp pain that is very localized while others report generalized, diffuse pain. Typically, the pain associated with a prolapsed disc will have a sudden onset of severe pain. Occasionally, the pain will be reduced when the patient lies down. Other symptoms of a prolapsed disc include numbness and tingling. Some patients report radiating pain (e.g. pain traveling down the leg to the foot, etc.) that results from nerve root pain that travels along the spinal column. Research has been somewhat inconclusive as to why prolapsed discs occur. However, some individuals may have a predisposition to develop a prolapsed disc due to congenital weaknesses in the outer layer of their intervertebral discs. Some researchers believe that the intervertebral disc weaknesses can also be the result of normal wear and tear that occurs over time. If you have any of these risk factors, talk to your doctor about ways to prevent a prolapsed disc. If you suffer from a prolapsed disc, there are methods to manage your pain and get back to your life. What follows are some common treatments, but always talk to your doctor for a treatment plan that is unique to your lifestyle and severity of your prolapsed disc. For example, swimming is a low impact activity that many patients with prolapsed discs can participate in without the fear of aggravating their injured disc. Physical therapy can help patients resolve the underlying cause of their prolapsed disc. Pain medications that are available over-the-counter can provide relief if you’re suffering from mild to moderate pain. A non-steroidal anti-inflammatory medication is sometimes recommended for those who are suffering from more severe pain. These medications can help to reduce inflammation of the affected area, and thereby help to reduce your pain. If you’re suffering from more severe pain, your doctor may recommend cortisone or prednisone. These are oral steroids that may help reduce inflammation and pain in the affected area. Spinal cord stimulation involves implantation of an electrical impulse device near your spinal cord. This can help control pain signal transmission from spinal nerves. TENS therapy uses a small device that delivers mild electrical impulses to the affected area via electrodes attached to the skin, modifying pain signal transmission. Epidural steroid injections involve injecting an anesthetic and steroid into the affected area to essentially block the pain signals. You can see what to expect during this procedure in the following video. Alternative treatment options, including biofeedback training and acupuncture, have also shown to be effective for pain management. This is especially when you use them in combination with other therapies. Prolapsed discs occur due to changes in the intervertebral discs of your spinal column. They occur when the inner layer of the disc bulges outward because of weaknesses in the outer, fibrous layer. A prolapsed disc compresses nearby nerves which can lead to chronic pain in the affected area. Although any intervertebral disc in the spine can be affected, those in the lumbar region most commonly experience prolapse. There are various treatment options for prolapsed discs. These range from conservative home therapies to more interventional treatment options for severe pain. If you’re suffering from lower back pain that may be related to a prolapsed disc, talk to your doctor. Make sure to explain the symptoms you’re experiencing, as well as the treatments you’ve tried. Your doctor will be able to determine what treatments may provide the most benefit for your pain. Kanna RM, Shetty AP, Rajasekaran S. Patterns of lumbar disc degeneration are different in degenerative disc disease and disc prolapse magnetic resonance imaging analysis of 224 patients. Spine. Nov 2013; [Epub ahead of print]. Manchikanti L, Boswell MV, Singh V, Benyamin RM, Fellows B, Abdi S, Buenaventura RM, Conn A, Datta S, Derby R, Falco FJE, Erhart S, Diwan S, Hayek SM, Helm S, Parr AT, Schultz DM, Smith HS, Wolfer LR, Hirsch JA. Comprehensive evidence-based guidelines for interventional techniques in the management of chronic spinal pain. Pain Physician. 2009;12:699-802.